Dallas, TX – Broadleaf Commerce provides robust commerce solutions to support enterprise retail brands. They’ve recently been named in Inc. 5000’s List of Fastest-Growing Companies in America for the second year in a row. Their brand is rising to the top, and that’s no accident. The company practices effective and efficient strategies, both internally and externally, in order to compete. Broadleaf has experience with marketing automation solutions outside of Lead Liaison. Prior to using Lead Liaison’s solutions, they used a competitor for email campaigns, website tracking, and social media. They started looking for an alternative solution that would enable them to do their wholistic prospecting and marketing automation within a single platform. They needed a solution that better aligned their sales and marketing team, with automation tools and the ability to personalize content. After much research and consideration, Broadleaf Commerce chose Lead Liaison to replace their current marketing automation solution. In the video testimonial released this week, Broadleaf Commerce’s Chief Operating Officer, Brad Buhl, and his team speak to the reasoning behind that decision. Lead Liaison’s Sales Enablement is one of two cutting-edge solutions the software provider brought to the table over the last year – the other being their innovative event lead management solution. Sales Enablement provides a suite of sales solutions designed to make salespeople’s lives easier. 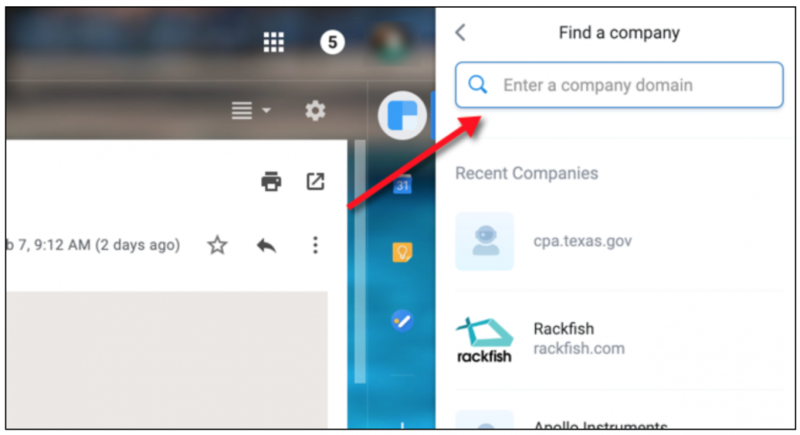 It provides two-way email sync so reps never have to use Bcc addresses to get content into their CRM, a sales automation functionality called Rhythms to help reps book more meetings, and even more customization options. From a sales velocity perspective, Lead Liaison’s solutions allow Broadleaf to see when their team starts working with a customer, how long it takes to close and what the steps are to get them closer to close. What’s more, they can zoom out even further and look at the leading indicators for how a lead originated, to getting to the point where the customer reaches out. Broadleaf Commerce’s account executives also use Lead Liaison’s CRM and Sales Enablement functionality for organization and outreach purposes. Their marketing team uses Lead Liaison’s marketing automation and website visitor tracking solutions to create and distribute relevant and educational content, thus creating meaningful exchanges that build brand awareness. Their leadership team utilizes the reporting and analytics that come standard in Lead Liaison’s software. The collaboration between departments gives Broadleaf a lot of insight into their prospects and the kind of information they should be leading with when they make contact. This video testimonial, plus many more, are available here. Dallas, TX – Sales and marketing solutions provider, Lead Liaison, announces they now offer their most recent add-on solution for sales enablement as a standalone license. Lead Liaison’s sales enablement solution was launched in December 2017 as an add-on to their marketing automation suite. While its popularity has grown exponentially over the last 6 months, the solution was never offered independently until now. Companies continue to seek to improve their sales teams’ productivity. In 2017, there was an increase of 81% in organizations that reported sales enablement functions, programs, and titles over 2016 (registration required). And it’s not just about sales teams – sales managers seek empowerment as well. Lead Liaison’s sales enablement solution offers the tools needed to build repeatable processes and gauge performance of team members, thus enabling sales managers as well as their teams. Lead Liaison knew they had a winner on their hands after surveying the competitive landscape. Companies offering similar standalone solutions lack the additional pieces required for a complete solution. They don’t offer an ideal integration with a CRM or marketing automation system. All the cornerstone pieces of a sales and marketing stack are still very disparate solutions. Now, Lead Liaison is able to offer companies a standalone solution for sales teams with the option to upgrade their marketing stack with one partner. Lead Liaison’s Sales Enablement solution is powered by Rhythms™, which can be succinctly described as sales automation. Reps can build out prospecting plans that help book more meetings and create more conversations. Additional features of Lead Liaison’s Sales Enablement solution include task management, email automation and two-way email sync. Two-way email sync allows reps to see all of their emails sent from any device in the timeline of a contact’s record. It supports all major email providers including Exchange, Gmail, Office 365, and more. Lead Liaison hosts the industry’s only unique combination of online and offline sales capabilities, like postcards and handwritten letters, which can be included in prospecting plans alongside scheduled tasks, SMS communication, and more. To learn more about Lead Liaison’s Sales Enablement solution, visit this webpage. To watch “An Introduction to Sales Enablement” in its entirety, click here. 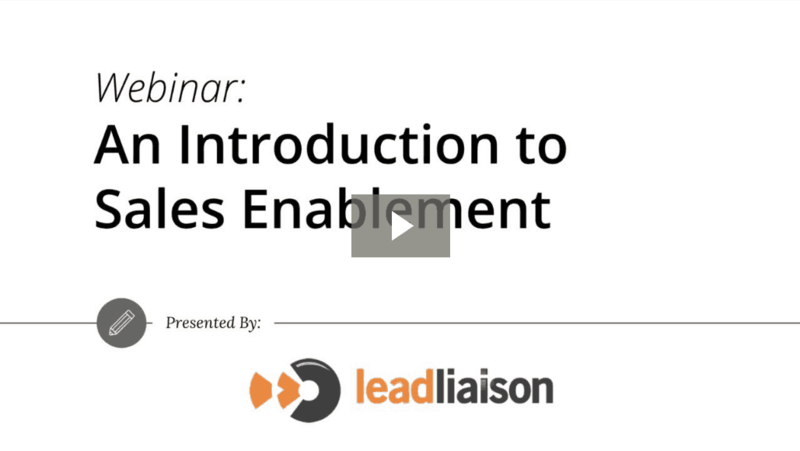 Lead Liaison provides an introduction to sales enablement. Learn the definition of sales enablement, why companies use it, and how it can help your business. We also compare and contrast sales enablement vs. marketing automation and break down how these two technologies complement one another. So let me cover three buckets. Bucket number one would be your company might be using email marketing. So maybe you’re using MailChimp or constant contact, or your even using marketing automation, which in a way it’s like version 2.0 of email marketing. But with number one, you might be sending out a bunch of emails. We just talked to client the other day, and they’re shooting a bunch of emails out through Mailchimp, and their sales team is hoping for people to respond and email them back, and their sales team is even following up on people that have just click links. That’s how they’re measuring engagement, just a link quick and taking action on that. So we like to say that those kinds of company, they’re just sending out email blasts. They’re doing very basic marketing around email but they’re blasting their database. But sending a generic message to your entire database, you’re not segmenting people. Bucket two is really companies that are using marketing automation for both sales and marketing purposes. Definitely sales can benefit from using marketing automation. A good philosophy there is that marketers are producers and sales people are consumers. But what you don’t want if you are falling on bucket number two, you don’t want to be using marketing automation to do your prospecting and do your sales outreach. You don’t want to be running your cold contacts through your marketing automation system. Bucket number three is where you carve out marketing automation and you dedicate that for marketers, and then you have a sales enablement suite, and your sales people use that. So ideally you want to be in bucket number three, and in that way, sales and marketing can kind of work in harmony. What is killed enablement? Again 24%, 1 out of every 4 people here don’t really know what it is. So I’m going to throw a definition out there to everybody. Sales enablement means continually increasing efficiency of your sales ecosystem through the use of strategies, tools and process. What does it mean to be continually increasing? Well the main thing is that you can’t stop improvement, you can’t stop changing, You know, if I look at our own company, Lead Liaison, as an example of that, we introduced marketing automation in 2014. So four years ago, we rolled that out. Obviously, we want to be using our own software that’s how we’re growing our business so rapidly. So we like to say we drink our own champagne. We never say we eat our own dog food. I don’t like to eat dog food or be blasted, like I mentioned earlier. So the key is always continually improve. We’re using our own software, but we’re always making changes, we’re changing our qualified lead flow, we’re changing our messaging, we’re always refreshing the content, for tweaking how we do prospecting. Never rest on your laurels. Never be complacent because if you get complacent, I think that will lead to failure very quickly. So you’re continually going to make changes. Efficiency, well what does that mean? You got to really be using automation at the core to be efficient. You got to be really organize. So that again, you can scale your business. And in these last three words, I’m going to touch on the next slide about strategy tools and concepts, I’ll explain that. And by the way, sales enablement, you gave a lot of definitions out there today. You may have heard of sales enablement as sales automation, sales intelligence. It’s really all the same thing in our crew. It’s a bit subjective but it does have different means. So you’ve got to have a strategy. You got to figure out, are you going to target certain accounts? Are you going to focus on specific industries or regions, and you really got to know who your ideal buyers are, that’s very important. Lead Liaison actually offers a particular document, it’s on our website under our resource library. We call it an SOA, Service Level Agreement. It’s a really good tool to use between your sales and marketing teams. It’s treated down those. You can get that again from our website. But here, just have an agreement or a template, define your buyers, define your sales plan, know who you’re going after, identify, you know, what is a qualified lead, what is the lead, define those things, make sure both teams really agree there on what that is. But, again, you’ve got to have a strategy. The tools, right, so again sales enablement is a bit subjective, but remember in the definition, I talked about providing solutions for that failed ecosystem, helping sales with everything they do, everything they touch. You got to have a CRM. It’s great if you have meeting automation. Send out a link, schedule a meeting, you could use solution bud call away. We’re also working on something to help automate the scheduling of meetings. But instead of going back and forth and working out availability for parties, send the link, they can click it, see their availability schedule. You really need stuff like visitor tracking that’s a great sales enablement tool to help identify businesses and people that come to your website, and give you key sales intelligence. And again sales automation engagement, sales intelligence, whatever you might refer to it, that’s kind of part of the suite, which I’ll go over in more detail. And then you got have a process. You got to document what you want your sales team to do. It could be in Google Docs. Within Lead Liaison we use a solution from atlasin, it’s called Complements, its kind of a Wiki. We use that for our public documentation and internal documentation. And then you got to train your sales team. So all of our demos, our client meetings, on boarding, we record everything. So we use notes, we use GoToMeeting, record everything, upload it into YouTube, make it unlisted, so that you can just pass out links to people as needed. But use that material to give back to your sales people to train them, to make them more efficient. And then the last thing is measure. It doesn’t get measured. It doesn’t get docked. So you have to have these strategies, tools and process to really do a good job at sales. What you’re looking at is what I would call a super graphic, right, not just an infographic but a super graphic. Taking sales enablement tools is really difficult. By the way, the super graphic is provided by Scott HYPERLINK “mailto:Brinker@chiefMarktax.com” Brinker@chiefMarktax.com, want to give the proper attribution there. There are 5,381 solutions on the super graphic from 5,000 companies that is a lot. Can you imagine if, you had to pick from this 5,000 different companies. It’s impossible. 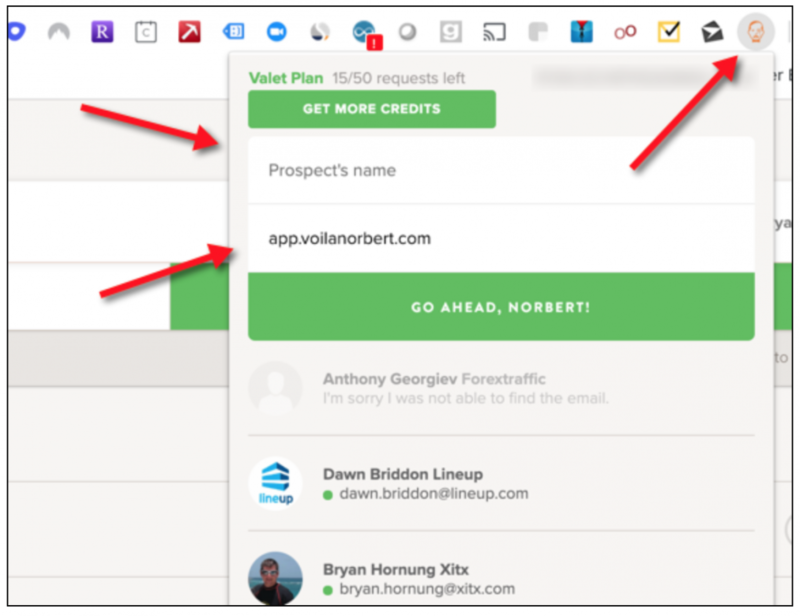 And there’s several hundred just in sales automation which you see in that red box right there. In the blue box, on the bottom left, you see marketing automation. Lead Liaison fits into both of those buckets, we deliver solutions in both areas. The key is you want two things to be working together. You don’t want these to be dispersed solutions. Now, what you see here, this is from 2017. In 2016, there were less. So you know, so 2017, there were 39% more solution. So the sales and marketing ecosystem is just getting more and more complex. The good news is that I’m going to simplify that for everybody in our discussion here. I’m really going to focus on sales automation and marketing automation. So just the automation piece. Number one, I’m going to give you again five differences, number one is really the obvious, which is the people, you know, marketing people should be using marketing automation, salespeople should be using sales enablement. The second difference is where should these solutions be used. Now, what you’re looking at here is a very primitive funnel, suspects, leads, opportunities, clients. Your funnel could be more detailed, which is fine, but at the highest level, you have what we call suspects. What that really is, is basically just a person. They have no idea who you are. You got them from a list, you pull them out of the phonebook, it doesn’t matter. They are suspect. A lead is somebody where you may be engaged them, you’ve generated interest. They now know who you are. The difference here is in that minty color, sales enablement is at the top of the funnel. And by the way, this is not just the sales funnel. The world is moving to sales and marketing funnel. So you got both groups within a company contributing to your funnel. But sales enablement is at the top of the funnel. It’s really geared around booking more meetings, filling the top of the funnel. That’s the goal of sales enablement. On the other hand, marketing automation is, you can see, as you, in more areas of the funnel, it’s used to help nurture your lead. It’s used around opportunities, upsell, cross sell, things like that. And a lot of people just forget that marketing automation is really, really applicable to clients. It’s not a lead gen tool. Marketing automation’s purpose is to help you shorten the sales cycle, to drive bigger deals, and you do that for building strong relationships by communicating in a very relevant way. That’s what marketing automation can do is help you segment and communicate and have conversations, not blasting people. The key takeaway from this slide is that they need to complement one another. Again, earlier in the poll, we heard 5% of the attendees used marketing automation so they feel they don’t need sales enablement. It’s a little bit of the wrong approach there. The third difference is in email. So again, I’m largely speaking about automation. The third difference is in how emails are delivered. Marketing automation is going to send your email through the provider’s network. Those emails must have an unsubscribed link, because you want to be can spam compliant, etc. Those emails will not show up in your sent box. 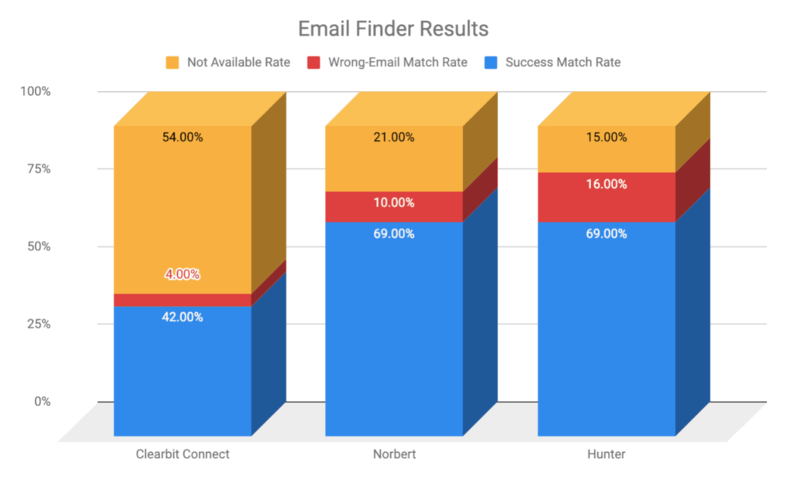 The difference is that when you’re using sales enablement or sales automation, those emails are going to go through your own service provider. So it could Gmail, could be Exchange, Office 365. It’s basically just like going into Outlook or Google mail and sending an email from your email client. You’re going to see then your sent box. You don’t have to put in unsubscribe link in there, and you’d probably do get better deliverability of your emails. So the way that emails are sent are very, very different. And then the last thing is you know, simplicity right. We got to keep sales automation, sales enablement, very, very simple. We can’t make it complex. Going back a little bit marketing automation. It is going to be more, I think difficult to use, right, because you just, you’ve got more options. So it can be confusing for some people. Those technical marketers I think really get it. But again, you got additional business logic. You can wrap around things. And so again, it’s more complex, more actions. So why do sales reps need automation? Well I’m throwing some very quick stats out at you, and these stats by the way are furnished by the TAS group or Task Group Marketing doughnut and brain shark. So 67% of reps don’t hit their quotas, 2 out of every 3 reps miss their quota. Half of all sales teams don’t have a playbook. You got to have a playbook. The third point here is to take an average of 8 cold call attempts to reach a prospect. My take away there is cold calling really doesn’t work these days. You know, for me, I really don’t answer my phone. I do screen and I see the caller ID, I don’t answer. You got to try different approaches. The last point here is it’s very tough to on-board people. It takes about 10 months for new reps to really be productive and get up to speed. So that the key takeaways here are reps are increasingly unsuccessful, especially if they do not have a plan, and it’s very hard to reach people and ramping up new reps is difficult. So what’s the solution? It doesn’t matter what your sales role is. Now you probably fall into one of these two buckets– account manager, business development reps. Now, some companies call them account managers, some companies call them major account managers or outside sales reps. The bottom line is you’re the person that probably build the relationship a little bit more. You might be traveling. You might be focusing on your 50 or 100 top-tier accounts for your business. You might be doing what they call ABM or Account Based Marketing, just focusing on specific accounts. You might be in that bucket or you might fall into the business development rep bucket, where again, you could be called a biz Dev rep, a sales development rep or an inside sales rep. There’s many names but you you’re typically in one of those two buckets. The key thing is you got to have a plan. You can’t just be calling. You got to have unique, multiple touch points, and you really have to create messaging across your organization that’s consistent so that you can, what we call plug-and-play with your reps. So if your reps leave, which that happens in sales, you get a lot of turnover. You want to pull in your new reps, you want to be able to plug-and-play and have them pick up where your reps left off, and have all that messaging be consistent. So Lead Liaison, to tell a real quick story here, we evaluated a number of sales enablement solutions. You know, we looked at various players out there, but we really found three problems. Number one, nothing was integrated with marketing automation. That’s kind of our history, we started visitor tracking and marketing automation, but we found sales enablement was really disconnected. You have to copy and paste data from one system into your marketing platform, and they just weren’t integrated. They were also a little complicated. Again, you want to keep them simple. And they were not multichannel, everything is just email only. So I’m going to show you on our app what some these things look like, but I’m going to give you some screenshots. This is from LeadLiaison. Now, what this is sales automation. Other providers in the market, they might call what you’re looking at a sequence. They might call it a cadence. They might call it a flow. It doesn’t matter what the name is. For us, Lead Liaison, we call it a rhythm. We chose that name because sales is about getting into a rhythm. It’s establishing your momentum, your flow but diving and getting into that rhythm, getting used to things, that’s what it’s all about. You want to have that rhythm to really be your second thing. A few key things, you see on the left, when we designed this, we said, “Man, we got to make it multichannel.” What I mean by multichannel is not just email, right, but have the ability to send a handwritten letter. Have the ability to send a postcard, to schedule a unique task in the time. That’s really important. Make it multichannel. The next thing that’s really important is give the reps options. You want to have some multi-variant testing, not AB testing the ABCD all the way up, multi-variant, try different things but don’t make it too complex, if then, logic and things like that. We also want to be able to very easily add people into your rhythm. That’s important. We are working on, and integration with zoom info, we’ve partnered up with them. So that’s the key thing, you know, you want to be able to find and kind of target certain people, and then add them into your flow to then create that rhythm. One more thing you really want is you want to make sure you’re organize, right, and as part of your process. So the most efficient reps these days, they stay organize. So you got to have a really good task manager. You want your reps coming in and not say, “What should I work on today?” You want them to click a button and “Hey, these are overdue. I got to make these phone calls or here’s what’s due this week.” So you want to have a really good task manager. We built that into Lead Liaison. And then also, you want to make sure you can measure. If you remember what I said earlier, if it’s not measured, it’s not done. So in this case, how many people were added, finished, and how many people are engaged in your particular sales automation or your outreach. So that that’s really about, again, those flows, those rhythms, those sequences, again, whatever you want to call them, but there’s really more to sales enablement. Here I’m showing you on my screen, on your screen, sending an email from an iPhone, from an android device, from Outlook, from Google mail. 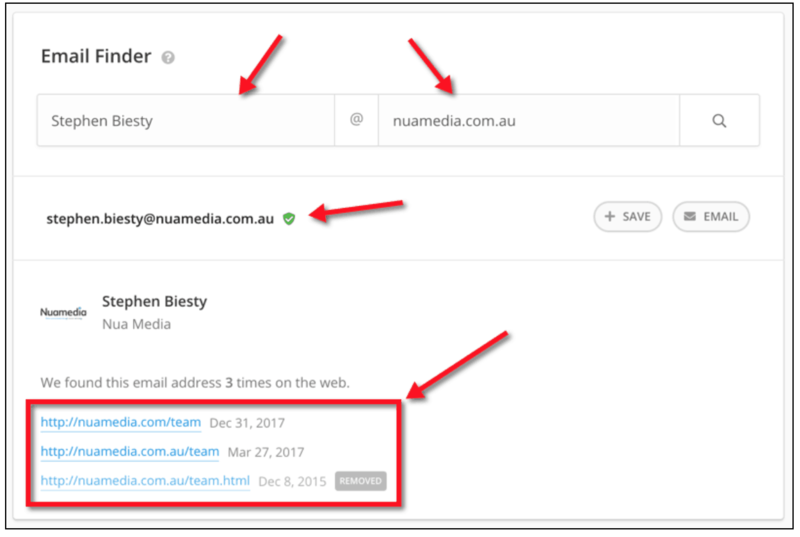 You know what you really want is you don’t want to have to use an email address and put that in your BCC field so that it gets stored in your CRM. About six, seven months ago, Lead Liaison released a free CRM. It’s called OneFocus. The essentials are there to create deals and tasks and so on so forth. But one thing we realized is let’s not make it difficult for reps. We just want to make sure that no matter where they’re sending an email, they’re on the road, and God forbid, sending an email from their phone while they’re driving, they’re at their desk, wherever, it doesn’t matter. We want to make sure that email goes into the CRM. So that all that information can be shared in a central area. This is what we call a prospect profile for us, but it doesn’t matter where those emails are sent, you want them all to be threaded, and in line, so that if another rep checks out this page, or the marketing person, everybody knows what is going on. Here is sending an email from the application itself. So this is just native email. There is a bunch of different capabilities in there to help make reps more efficient. This is the interface, you know, you can build out these different actions, I’ve mentioned these actions here on the left. Again, you want to make sure you’ve got different versions, if you will. You can add that. So either you’re different variants here. You want to make sure, again, that you can measure things again– added, finished, engaged. Ryan Schefke: So here we can see, you know, how many individual prospects you are putting in, what’s the stag, or what steps are they at, and your overall flow. Looking at your emails only, so you want to be able to take all your different action types and just may be drill down a little bit, and see how things are performing. You also want to know what tasks have you set up for yourself. So you can see a tasks tab over here. And then you got different settings. So again, when people reply, you want to remove them. These are called suspect statuses, but based on what happens, what you want to set their status to be, you want to set some goals, things like that. It’s giving you a preview of what we’re doing here with zoom info. So you might want to pick from your own account, inside Lead Liaison, certain companies, certain named accounts that you might have or maybe do a general search, you want to find those people, put in your criteria, and then once you find them, add them into your rhythm. So making it easy to insert people in there to fill the top of the funnel. I just want to quickly compare and contrast here, marketing automation. This is an example of marketing automation from us. So you can see these individual actions, you got way more actions, changing data values. You don’t just have sending an email or sending a handwritten letter, things like that. You’re tagging, your moving things around inside the system, you’re adding different conditions around your actions. You are creating your business logic. So it’s much more complex with these kinds of system. And you’ve got different pipes typically. So you can see here, we offer, four different variations. So much more complexity, if you will, but with the complexity comes more power, more options in things that you can do. –you want all that your sales enablement system. Also to keep it simple, you know, depending on again, if you’re an account manager or if you’re an inside sales rep, you know, maybe you want to build your rhythms or your sequences, whatever you want call them, and then keep them in a certain folder. And you want to put your rhythms and keep them organized and put them in certain folder. I do want to highlight again the two-way sneaking stuff that I talked about. Here’s an example of a profile inside Lead Liaison. You can see that in the timeline here, this is a two-way email thing. It doesn’t matter where these messages are sent from, you know. We want to basically take all that communication automatically put it into the system, inside the profile, and that way you can see the entire contents of your message. And that can be shared with your team. And then also, you can take direct action that you could reply, and do something on that message, if you needed to. So let’s say I’m in the profile, to give you a quick example, you got different options when you’re sending email. And again these are built to help the salespeople. So maybe you talk, in this case, I talked to Mike, we have a great conversation and he says, “You know what, let’s just touch based in about two months.” Well, probably I’m going to forget or I’m going to get busy and I won’t come back to it. So the key is, right after I get off the phone, I can write my message, I can schedule sort of a certain day, in a certain time, and then I can set it and forget it. I can send it out. So I don’t have to worry about that. So let’s just send later future. By the way, there’s also an undo. So maybe I sent something and I go, “Oh oops, I shouldn’t have said that or I should have added something,” There’s the ability to undo. You might have those plug-ins inside your email, client that we build out, they can write into Lead Liaison. You can add a reminder. So maybe if the person doesn’t reply after a certain number of days or after a certain time, have your system send an email or create a tasks for you, again, that you could manage in your task manager. You want to be able to create sales template in the platform. You know, create your messaging ahead of time, and then insert those easily, put in snippets. For example, if I wanted to insert a little snippet about your company, now that’s a great used case to be able to insert that so that everybody is consistent. And then you got option two, you know, have dynamic signatures, put those in, so you have merged fields to track your open, track your clicks. That’s all sales enablement here, again, having the ability to send email from a profile and then having these different options to make things efficient for you. Then you might have these different status. New suspect statuses. So as you’re working with your sales automation system, you know, you’re putting people into those rhythms that I talked about, depending on what happens, if they reply, if it bounces, you want to automatically update their suspect status. One of the keys here is that you are managing everybody you know all your prospect in your town pace marketing, that’s happening in that suspect stage. But when somebody engages, they move automatically to engage. And that’s where your marketing automation system can kick in, and maybe nurture those people for the long run. That’s really again where the two systems complement one another. Once you have that again, you got harmony between marketing and sales, sort of bringing everything together. I do want to give you a couple of references here. Number one, we do have some training which is open to everybody on sales enablement. So you can access that training by going to salesandmarketinguniversity.com. You can learn more. There are three particular lessons in this training course, and you can apply. So just click, once you go to salesmarketinguniversity.com, click that apply for course, one of our trainers will accept it, and then you can go ahead and watch some of those capabilities to reinforce the learning here today. Ryan Schefke: The other thing I mentioned is I’m starting—we start a service level agreement. So you can get that from the resource section on our website. This is our pricing. I figured this was just easy to show to this to everybody, not trying to push Lead Liaison here, just trying to help you understand how we group things. The last two columns, these are really the sales enablement solutions. We do have sales pro-user seats. You see the rhythms that I talked about. Those rhythms are not available yet. They will be released at the end of March at the current plan. But you know, we do have all those other capabilities, that two-way email think, scheduling emails later, the undo, all of those things in that particular package. Inbound is really about visitor tracking and picking up more sales intelligence for your team. But again both of those solutions are sales enablement. 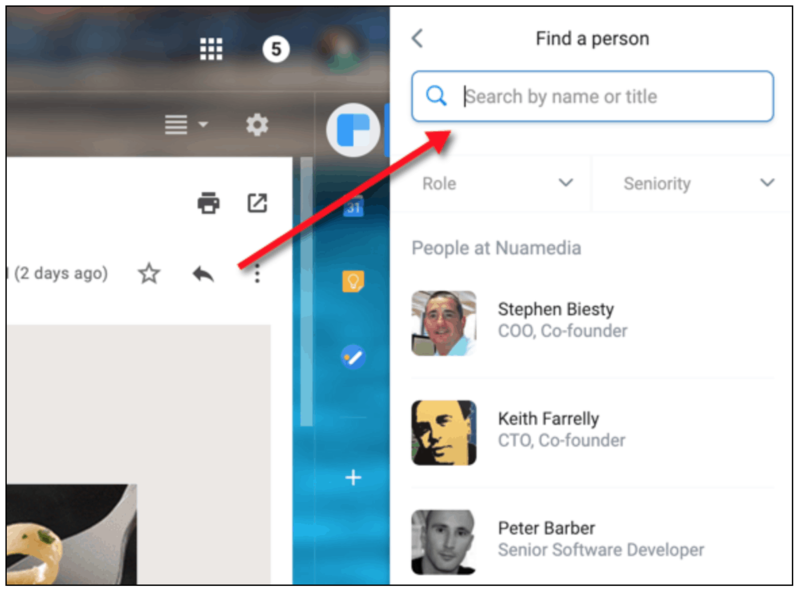 Q: When is the Lead Liaison search email available? A: We do have sales enablement today, again, you’re going to get a lot of those features, which will be that two-way email think, again, no matter where you’re sending emails, they’re going to show up in that timeline and be shared with everybody else. You can send later, you can undo, you can use sales templates, you can use the snippets, there’s going to be tracking of all those emails—all of that is available today, right now, from us, and again, end of March is when we expect to be GA, which is general availability, with our rhythms. Q: Sales enablement really for business development managers or account managers? A: Yeah, it’s really for both. If you’re doing business development, you’re probably targeting more people. Now, you know, the important thing is, even though all of those emails are sent through your exchange server or through Google, or Gmail, you still need, there are limits right. So you can trip thresholds and you got to be careful. We’re actually building in some throttling capabilities to throttle that. But again, if you’re more of a biz that person, you might be dealing with a larger volume of leads wherever you got those. But I think it’s still important to really not focus on quantity but to focus on quality. So our rhythm feature is really meant to allow reps to be very hyper-focus in a certain area. It’s typically a best practice to be jamming contact through the system. You know, I would say the smaller the better, the more targeted, it’s definitely quality over quantity there. You know, if you’re an account manager, you are probably dealing with major accounts. Like I mentioned earlier, you might have 50 accounts, 100 accounts, but this is perfect because with the rhythms, you know, keeping an account manager, is like I mentioned earlier, not just making those phone calls because it can take eight phone calls before you can reach somebody. I’ve actually seen stats that have better double that. So 15, 16 phone calls. You know, for me, the definition of insanity is doing the same thing over and over and over. So we don’t want to just be doing phone calls. You know, your reps are going to get tired. They’re going to want to quit. So you got to have some variation. You got to have that multi-channel. You got to sprinkle in some personalized communication. You got to sprinkle in postcards and handwritten letters. If you’re an account manager, you’re probably focusing on bigger size deals, high value, tens of thousands of dollars, perhaps. And why not spend $6, $7 on a handwritten letter to really make your attempt at penetrating an account very effective. So there is the difference. It’s really, they’re intended for both account managers and business development reps.
Q: How does sales enablement work with Salesforce. A: We also have that for Microsoft dynamics. We do in integrate with I’d say another half a dozen CRMs. Of course I mentioned we have our own essential CRM, some of the basic things in there, and we’ve got back, you know, that had allowed us to integrate with a bunch of other CRMs. But going back to the question, really sales enablement should be focused, you know, in the platform itself right. As I mentioned earlier, the two systems do complement one another because sales enablement is filling the top of the funnel. We really don’t want to do is you don’t want to, you know, load a bunch of stuff into salesforce and just, you know, muddy the water and have a bunch of contact data. You just want to be working these individuals through your sales enablement system. I do understand that, you know, that requires a rep to you know not use salesforce but to use a system like ours or something else, but you know, uses the sales automation system because it offers all those capabilities. When somebody becomes engaged, at that point, that’s when marketing automation takes over and marketing automation can help automate that process of pushing people, you know, into your CRM, like salesforce.com and then kicking in nurturing and things like that. So I’d say really, they work together very well, but it’s really about just making sure that you put qualified, interested people, people that engaged into the CRM. Q: Can I use sales enablement on its own, so without using other like marketing automation? A: So at the moment we do not provide sales enablement standalone. You do need to be using marketing automation from us, at this moment or some of our other solution. So at the moment, we do not offer sales enablement standalone. We might be changing that in the future. If we do, we probably will require a minimum number of users, you know four or five, something like that to get rolling. Those are the things that we definitely are considering, just because we’ve had a lot of demand it in terms of what we’re doing so far.